Bashundhara Group Managing Director Sayem Sobhan Anvir and his wife Sabrina Sobhan (C) are seen cutting a cake with other guests at the EWMGL conference room on Wednesday evening. The ninth founding anniversary celebration of Kaler Kantho, one of the leading Bangla daily newspapers in the country, has been kicked off with cutting a cake. 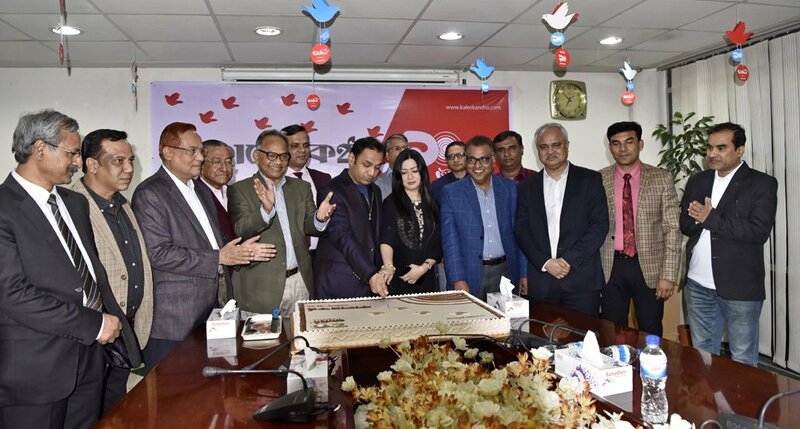 Bashundhara Group Managing Director Sayem Sobhan Anvir and his wife Sabrina Sobhan, inaugurated the activities of the ninth founding anniversary celebration on Wednesday evening. They cut a giant cake at the Conference Room of East West Media Group (EWMGL) in the capital’s Bashundhara Residential area in the capital around 7pm today. Kaler Kantho Editor Imdadul Haq Milon, Bangladesh Pratidin Editor Naem Nizam, Kaler Kantho Executive Editor Mostofa Kamal and Daily Sun Editor Enamul Hoque Chowdhury, Kaler Kantho Joint Editor Towhidur Rahman, NEWS24 Executive Hasnain Khurshed, EWMGL’s Publisher Maynal Hossain Chowdhury, Banglanews Editor Jewel Mazhar, Kalerkantho Online In-charge Ahsan Kabir, Advertising Department Chief Haruner Rashid and Circulation Department Chief Abul Hasan were present, among others, in the cake-cutting ceremony in the evening. With other scheduled programmes on the day on Thursday (tomorrow), a total of 30 teachers will also be given reception at 3pm. On January 10, 2010, with a slogan of “Angshik Noy Puro Sotto” (Full truth, not partial), Kalerkantho started its journey. The national daily, however, has earned a huge popularity among the readers at home and abroad with its objective and investigative journalism.